At about 10:15 we finally gave up waiting to be told to go to Manhattan and walked down the stairs. When we got there we found there as no queue at all; we were able to walk straight in. In fact all we did was parade towards a seated group of about 10 Swedish officials. Picking one each, we showed them our passports and cruise cards. They tok a very cursory look at these and handed us a ‘Passenger immigrated gangway pass’. I think the theory was that we were supposed to hand these in at the bottom of the gangway as we stepped onto Swedish soil. In the event, no-zone was in the least bit interested, and we’ve still got them. As we walked away from Manhattan we heard the promised announcement – “will all passengers who have not seen the immigration officials, please go to Manhattan now”. We walked off the ship at about 10:30 and had to wait a short while for a shuttle bus. It set off at about 10:45 and we reached the drop-off point on Strömgarten near the Palace just after 11 o’clock. So we weren’t any later than we had expected to be, but we were perhaps ninety minutes later than if there hadn’t been an immigration check. Our plan had been to visit the Vasa museum and then perhaps stroll around Gamla Stan, the old town. So we walked around the harbour, cut through to another harbour area, and walked along Strandvagen until we reached the bridge over to Djurgarten, where the Vasa museum is. On the way we found a cash machine and extracted 500 SEK. Then we reached the museum, or rather the back of a long queue for the museum, and as a result it was about 12:15 before we actually got inside. What we saw once we did was very enjoyable. We did an English-language guided tour with one of the museum staff – this was free – and learned some of the history of the Vasa, the context in which she was built, and of course the events of her disastrous maiden voyage – all 1.3 kilometres of it. We had a bit of lunch in the museum cafe before going back into the main hall and visiting all the galleries on five or six floors. 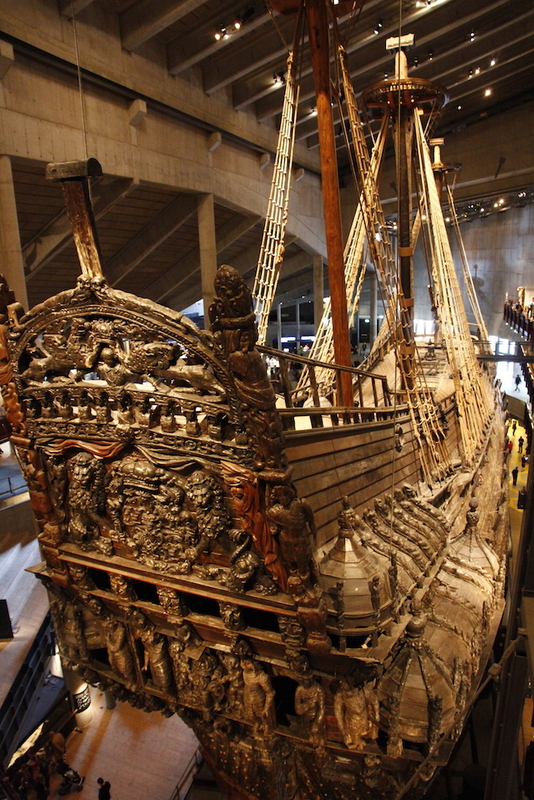 Thanks to the conditions in which she rested on the seabed, Vasa was excellently preserved – she’s about 95% original. So the main hall of the museum holds this almost 400-years old sailing warship, upright, with galleries around three sides allowing you to see into her and to see her hull close up (it’s not possible to actually board her – after 350 years on the seabed she’s too fragile). There are a couple of reconstructions to life-size in the galleries – the stern ‘Great Cabin’ and one of the gun decks – and you can get into the latter of these. The galleries hold huge amounts of information about the ship, the crew (they found 25 sets of human remains on board her), the objects found in and alongside her, and the salvage operation that raised and preserved her. All wonderfully interesting stuff. We left the museum at about 2:45. By this time it was starting to rain, so in keeping with our motto of ‘doing one thing, and doing it well’, we decided to forego our exploration of Gamla Stan and instead return to the ship. Retracing our steps to the shuttle bus stop took us a while, especially as it came on to rain quite hard, but in the end we were stepping back onto Azura at about 3:30. We spent all our Swedish Kroner. I withdrew 500, and getting into the museum cost 260 SEK, leaving 240. Annoyingly, our lunch main courses cost 250 SEK so I had to use the credit card for that. But later we also had a cakes for about 80 SEK, and we then managed to find things in the museum shop that cost exactly the 160 SEK we had left. So that was Stockholm. We both thought it looked handsome, and that it’s a place we wouldn’t mind visiting again. Tonight we’re going for a meal in XVII, which I gather is how the restaurant’s name is presented.